Responding to a nuclear disaster is no job for humans. Even while wearing protective suits, our bodies can’t handle the radiation. It could be a job for robots, though. 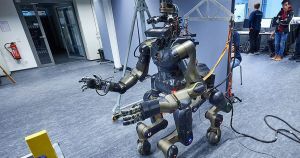 Researchers in the U.K. are developing a centaur-like robot designed to work in settings too dangerous for humans to navigate — and it could one day play a major role in disaster response efforts including nuclear catastrophes. On Tuesday, Horizon magazine published a story about the rugged robot, which goes by the name Centauro. The bot is just under 5 feet tall and weighs about 205 pounds. Its body is made of aluminum and other lightweight metals, while its skin is 3D-printed plastic. As you’d expect from its moniker, Centauro bears a striking resemblance to a centaur, the mythological creature with the upper body of a human and the lower body of a horse. This quadrupedal design makes the robot more stable on its feet than if it were bipedal, researcher Sven Behnke told Horizon. Each of Centauro’s four legs has a wheel where a foot — or hoof — would be. In tests designed to mimic real-world scenarios, the bot managed to climb stairs, navigate debris, and step over gaps. Each of its two arms has a multi-fingered hand with enough dexterity to unlock doors and operate power tools, among other tasks. Centauro is partially autonomous — if instructed to move to a certain place, for example, it can figure out how to do so. However, most of its actions are dictated by a human controller who wears a head-mounted display that allows them to see everything the centaur-like robot sees. “The main operator controls the robot through a telepresence suit which measures the motions of the operator’s arms, wrists, and fingers and transfers them to the robot,” Behnke told Horizon. According to Behnke, Centauro isn’t ready to navigate radioactive settings just yet. But in the future, the bot and others like it could prove to be invaluable resources for humanity in the event of another nuclear disaster like Fukushima or Chernobyl.